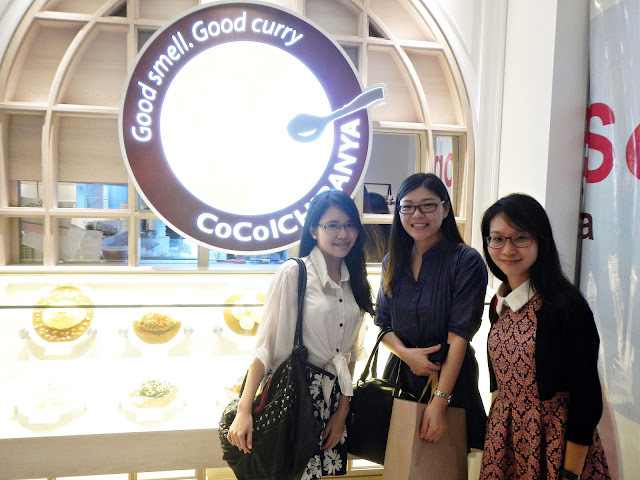 Some weeks ago, my friends and I visited CoCo ICHIBANYA, the World's No. 1 Japanese Curry Restaurant that recently opened its 5th outlet at Plaza Singapura. 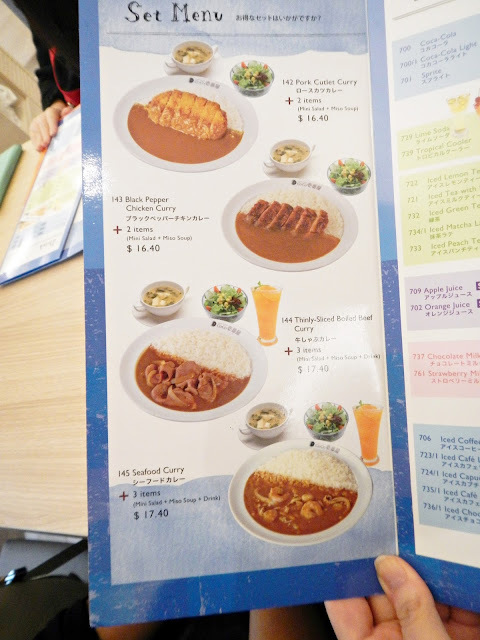 Currently, CoCoICHIBANYA is the only curry house in Singapore with such a wide selection in its menu. It has countless curry rice and omelette curry rice selections to choose from, leaving curry lovers spoilt for choice. From various renditions of chicken to a number of preparation styles of beef and even seafood and vegetarian options, any diner would find an item to their liking easily. Adding to the existing variety of options, there is even the option to make your own curry rice! Customers can choose to adjust the amount of curry, amount of rice, spiciness level and add any number of toppings according to your preference. 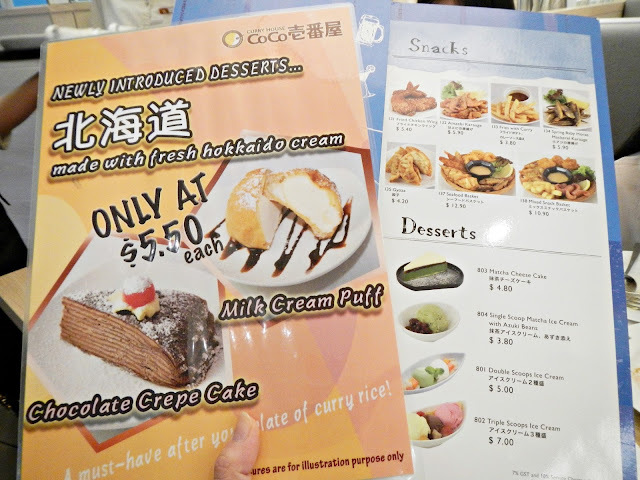 CoCo ICHIBANYA also has a value-for-money Set Menu option. 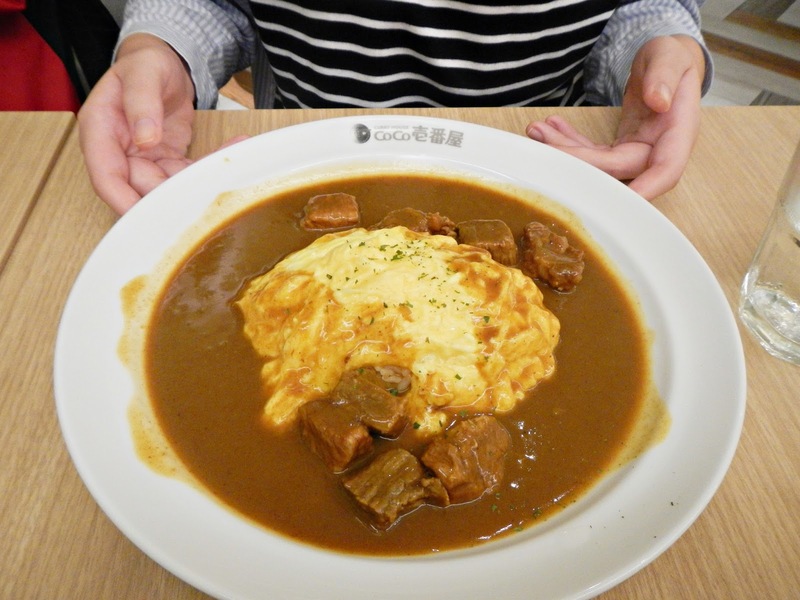 This is the Beef Omelette Curry with the standard amount of curry sauce, and of course, we can order for larger portion of curry sauce if we like. 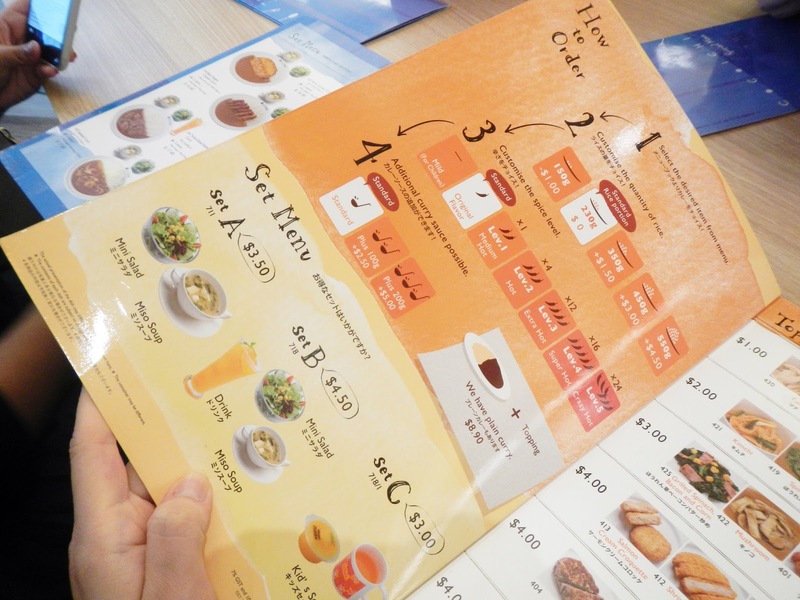 We can also choose the level of spiciness of the curry we want in our dish, starting from Mild, followed by Level 0 to Level 5, with Level 5 being the most spicy. 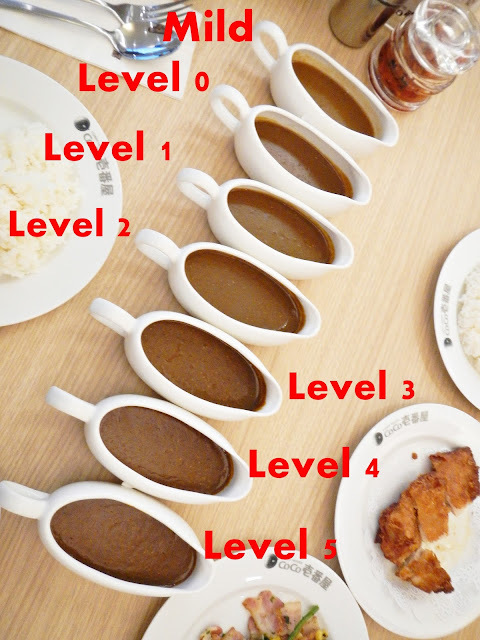 I think you can also notice from the photo below that the higher the level, the darker the colour of the curry. My friends and I find that the Mild curry sauce suited our tastebuds the most as we prefer the signature mildly sweet and rich Japanese curry to spicy, peppery curry. We had the Wagyu Beef Steak (S$10). The price is reasonable for a Wagyu Beef which was fresh and tender, but they only serve it medium rare, thus some parts were a bit too raw for our liking. We would really recommend this cooked well-done to be able to better taste the natural sweetness of this beef. The Grilled Squid with Mayonnaise (S$4). We love the soft and chewy tenderness of the grilled squid topped with a lightly torched mayonnaise, adding an extra light flavour to the squid. 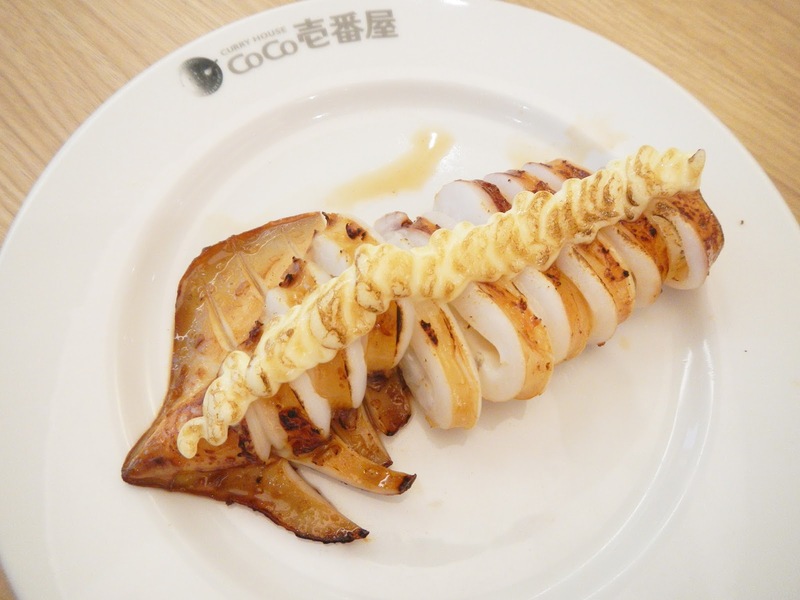 We love it that the squid was not heavily seasoned, and we could taste the original goodness taste of the squid. 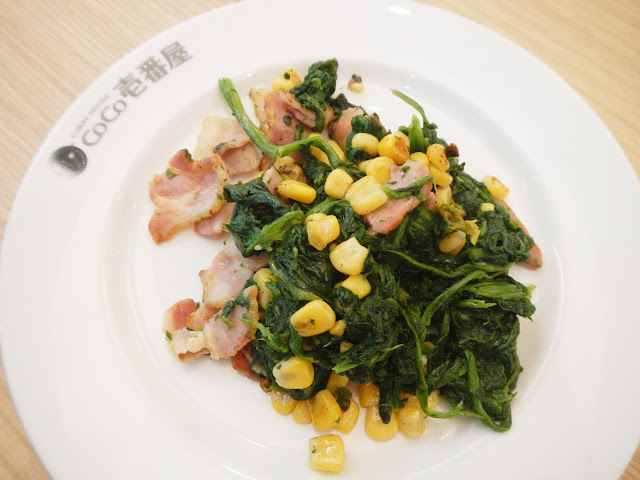 We tried the Grilled Spinach, Bacon and Corn (S$3). The spinach was cooked to softness and topped with the crunchiness and sweet of corn, coupled with a slight salty taste from the bacon which is a nice combination of taste and textures. This is a great option to add some greens to our meal. This is their Kimchi (S$2). 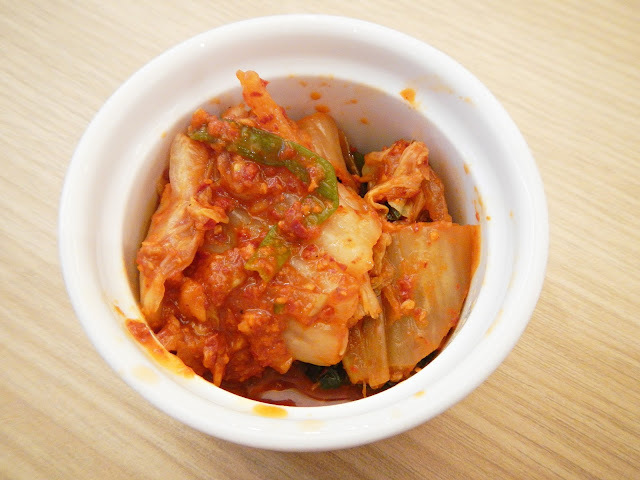 The Kimchi was a favourite dish for all of us. It was so well prepared and the taste was perfectly balanced. This dish sure did wet our appetites and made us craved for more. This is their Lightly-Crisped Chicken (S$4). The chicken skin was fried to a crispiness yet the chicken meat was not oily at all. It tasted almost like chicken breast meat yet not tough or dry, but it managed to lock in the tenderness of the chicken meat. If you can appreciate the texture of chicken breast meat, you will love this dish as well. Being a chicken meat lover, we also tried the Black Pepper Chicken (S$4). The taste of black pepper was very mild and it was only coated on the chicken skin, hence the chicken meat had no taste of the black pepper sauce at all. 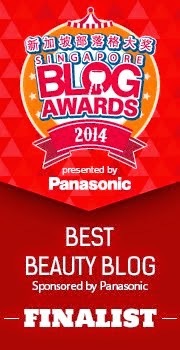 Once the chicken skin is removed, the chicken meat tasted like a normal chicken cutlet without any specialty. Personally, I find that it might taste better if the whole piece of chicken meat was marinated with the black pepper sauce and cooked together. We decided to try their Pork Cutlet (S$4) as well. 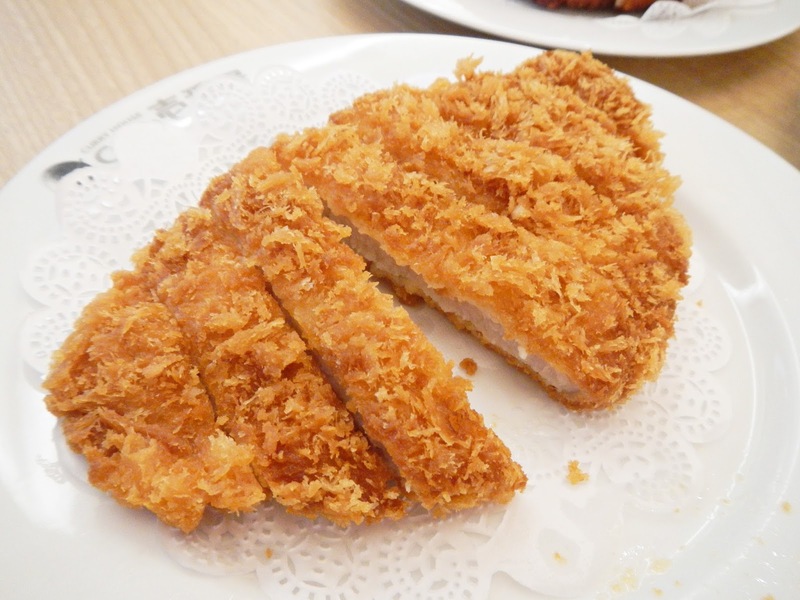 The exterior was definitely crispy, the appearance was very appealing and tastewise it was good but I would rate is as an average pork cutlet, as there's nothing special or too delicious about it. We had Crab-Stick and Mushroom Salad (S$7) and Chicken Teriyaki Mayo Salad (S$7). 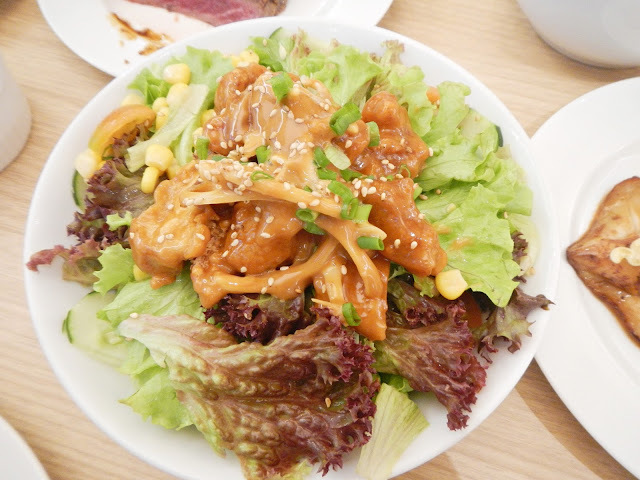 The Crab-Stick and Mushroom Salad is blander in taste but it might be a healthier option as compared to the rich flavoured Chicken Teriyaki Mayo Salad. I won't deny that the Chicken Teriyaki Mayo Salad tasted better and went excellently well with the fresh, crunchy vegetables and cherry tomatoes due to its richness in taste. 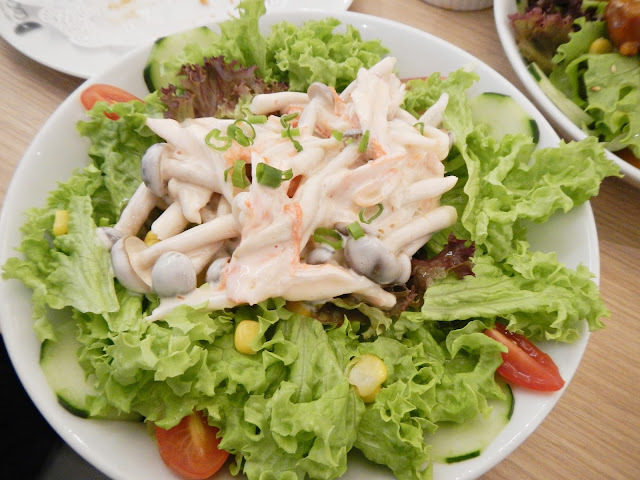 For the Crab-Stick and Mushroom Salad, I would eat it again if there were more mushrooms added because the natural taste of mushrooms would pair very well with the vegetables. Lastly, we had desserts to end our meals. 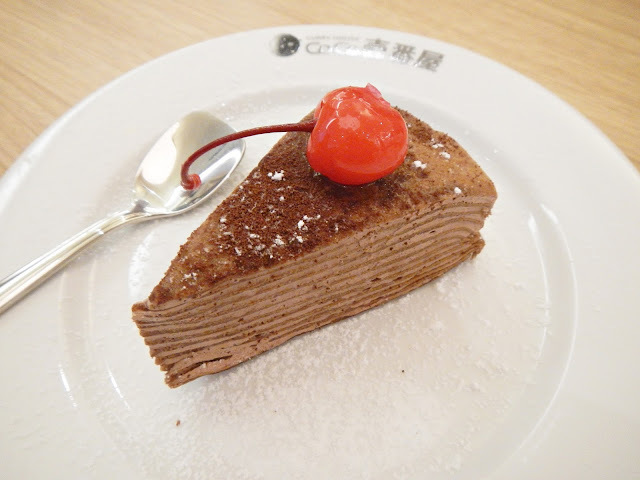 The Chocolate Crepe Cake (S$5.50). The chocolate was creamy and not very sweet in taste, it matched well with the crepe. Once in the mouth, the dessert melts and fills the whole mouth with a light chocolatey fragrant. This dessert is surely great for people who loves chocolates! 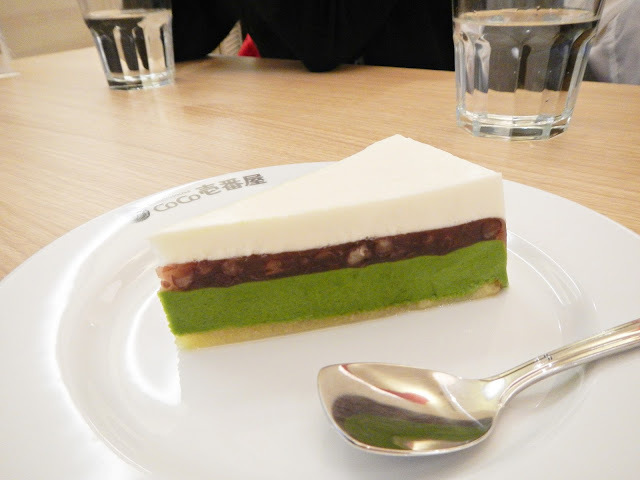 This is the Matcha Cheese Cake (S$4.80). I've not tried Japanese cheese cake before prior to trying this dessert, so to me, I did not taste anything like cheese in the dessert but tasted milk. The white layer tasted like milk pudding, very smooth and cooling, followed by the sweetness of the Azuki beans and the slight sweet-bitterness of the matcha. I really love the combination of all the taste and it was addictive yet not too sweet as overall. 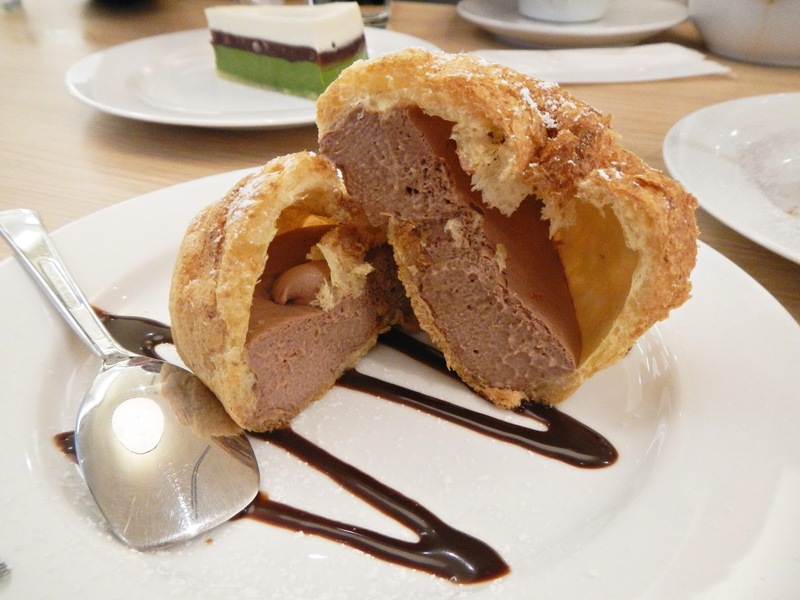 The Chocolate Cream Puff (S$5.50). The exterior was a puff and the interior Chocolate ice-cream. Personally, I find that the interior tasted like the chocolate ice-cream in Magnolia's Neapolitan ice cream but slightly more milky in taste. Got to eat it fast before it all melts away! I believe this dessert needs no introducing, but anyway, just in case you ask, this is the Matcha Ice-cream with Azuki Beans (S$3.80). 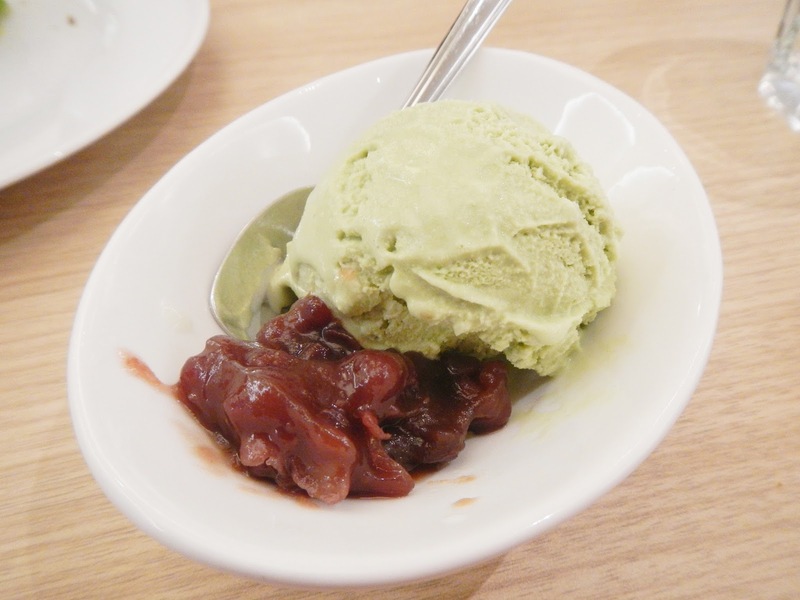 Anything with Matcha surely won't go wrong, likewise for this dessert! It has an acceptable sweetness level and won't give you an overdose of sugar. The taste was so nice that it is beyond description and thinking of this milky matcha is already starting to give me craving! By the way, do you know? 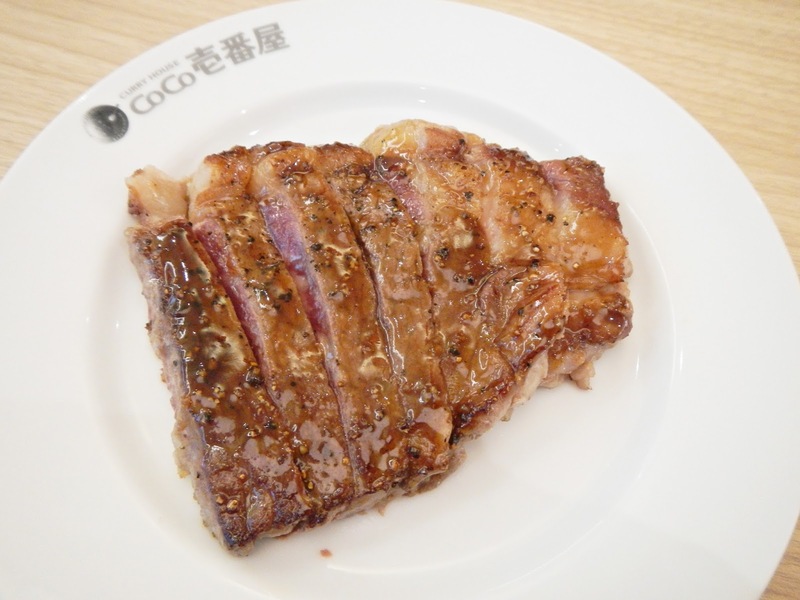 Students enjoy a 15% discount between 3 – 6pm on weekdays at every CoCo ICHIBANYA outlet.